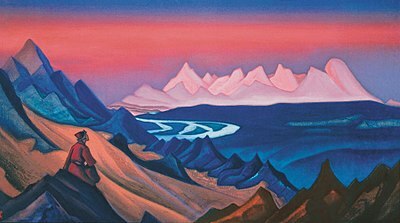 The fictional earthly paradise of Shangri-La, discussed in my previous post, derives from early Buddhist teachings about Shambhala, a remote realm of advanced spiritual practitioners. Shambhala is discussed in the Kalachakra Tantra, which Shakyamuni Buddha is said to have taught the Shambhala King, Dawa Sangpo, and 96 lesser rulers, over 2500 years ago. The King taught all the citizens, since this practice leads to rapid enlightenment, which he hoped would enable them to withstand a threatened invasion. This is the same “Kalachakra for World Peace,” that the Dalai Lama conferred last July in Washington, DC. “World Peace,” does not mean it makes one a blessed-out pacifist. 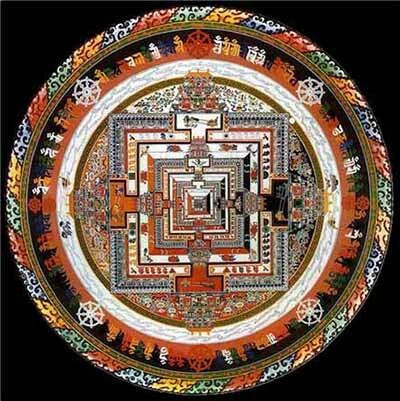 Kalachakra means, “Wheel of Time,” and explores the cycles that affect individuals and the world at large. It teaches that barbarian hordes periodically invade the civilized world and attempt to eliminate spiritual practice. Such an invasion, leading to world war, is predicted for the year 2424, at which time, the Kingdom of Shambhala will again manifest in this world to turn the tide. Proponents say that those who take the Kalachakra initiation will be reborn on the victorious side, and the end of this conflict will usher in a new golden age. (from, Alexander Berzin, Introduction to the Kalachakra Initiation, Snow Lion Publictions, 2010). In common with the older Hindu epic, The Mahabharata, the warfare described in this teaching has inner and outer dimensions. To the authors of Kalachakra, “barbarians” were non-Sanskrit speaking people who ate beef, and like Alexander the Great, periodically launched literal invasions. The authors also understood “barbarians” to mean our own treacherous impulses like greed, hatred, and jealousy, which keep us bound to the wheel of suffering. This inner war is part of every individual’s spiritual path. Scholars have located Shambhala near Mount Kailash in the Himalayas, a place sacred to Hindus, Buddhists, and Jains. They caution that only part of the journey is physical; arrival depends on knowing certain mantras and other spiritual techniques. A Western analogy that comes to mind is the Avalon of Marion Zimmer Bradley’s, Mists of Avalon. When the priestess, Morgaine, falls out of inner harmony, she cannot reach the sanctuary. In a similar way, some legends say King Arthur is not really dead. The story says he will rise again at the time of Britain’s greatest need, and numbers of people reported visions of mounted knights during the second world war. Paramahansa Yogananda (1883 – 1952), born in India, came to this country in 1920. He was probably the most influential teacher of meditation and Eastern philosophy in America in the first half of the 20th century. Yogananda predicted a similar time of turmoil, followed by a higher age of spiritual and creative growth. Eastern concepts of time are cyclical rather than linear. Yogananda outlined a 24,000 year cycle of four ascending and descending ages, analogous to what the Greeks called, gold, silver, bronze, and iron. Yogananda’s predictions are eerily similar to what the world is experiencing now: economic, climactic, and social disruptions. The good news is that in this view, like that of Kalachakra, we are on the cusp of a higher age. The bad news is, it’s not going to happen right away – as in, not in our grandchildren’s lifetime. Still, a well known Tibetan teacher, speaking of our “degenerate” times, reminded his audience of how fortunate we are to live when profound spiritual teachings are available. If we don’t get to chose all our external circumstances, according to Kalachakra and the teachings of Yogananda, we do get chose how to shape our response and our inner condition. This entry was posted in Buddhism, Myth, Spirituality, Tibet and tagged Buddhism, Myth, spirituality, Tibet. Bookmark the permalink. Spiritual undercurrents wrapped in facts — I love how well you do these posts. How kind of you to say so. Thanks, feedback is always welcome. Ah, there is hope. Thanks for an inspiring and fascinating post.